The Austrian economy shrank by 1.5% in Q1 2009, accelerating the downtrend after a contraction of minus 0.2% (preliminary) in Q4 2008. According to a (German Language only) press release from the Austrian central bank the negative growth figure came in much higher then the forecast of minus 0.5%. Austria faces stiff headwinds from the economic downturn in Germany, its main trading partner, and Central Eastern Europe (CEE), the backyard of Austria's economic expansion since 1990. 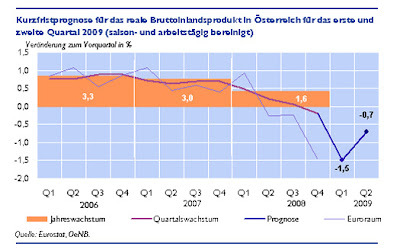 GRAPH: After enjoying solid growth rates until Q3 2008 the Austrian economy fell off a cliff. Forecasters are of differing opinions when Austria will return to positive growth. Chart courtesy of OeNB. "we expect economic activity to bottom out in the first half of 2009. The (recent) tax reform and economic stimuli should stabilize growth later." The central bank is cautious about the short term outlook due to strongly declining export orders. Most crucial is an EU emergency package for Eastern Europe since Austrian banks have lent some €230 billion to the region, outpacing all other foreign banks by multiples. As most of these loans are denominated in Euros and Swiss Francs East Europeans confront higher payments every month due to the weakness of their respective local currencies. An aid package envisioned by Austria has been rebuffed by the EU, reported the Wall Street Journal on Friday. European Union leaders, meeting at a Brussels summit, rejected calls to expand their fiscal-stimulus policies, or to boost aid for struggling Eastern European countries. The EU leaders said they are willing to provide $75 billion to increase the International Monetary Fund's war chest, provided the U.S. and China also pledge money. The IMF is seeking to double its resources for helping countries to $500 billion from $250 billion. But key EU countries including Germany and the U.K., are opposed to expanding the bloc's own fund for helping ailing economies in Central and Eastern Europe. Much of that €25 billon fund ($32.7 billion) has been spent on aid to Hungary and Latvia. Austria is under fire from all sides. The former world champion in tourism revenues fights with declining bookings while the machinery industry and automotive suppliers get choked by the problems of their predominantly German clientele. Deutsche Bank Research compiled Austria's dire outlook in a paper released on Friday that highlights Austria's dependency on its business partners. Due to high household indebtedness and the sharp economic downturn in Emerging Europe, financial markets have become increasingly worried about Austrian banks’ large loan exposure to this region. The strong financial and trade links with Eastern Europe, which have boosted Austrian growth over the past few years, have now become the Achilles’ heel of the Alpine Republic. Given the high importance of Germany and Eastern Europe for Austria’s export sector, the economy is highly vulnerable to the current growth weakness of these countries. Financial markets have sharply re-priced the risk for Austrian government debt over the past few weeks. At times, Austrian 10-year sovereign bond spreads climbed to fresh multi-year highs of more than 130 bp vs. German Bunds. 5-year sovereign CDS spreads soared to around 270 bp and are still on par with highly-indebted Greece and only topped by Ireland. However one has to bear in mind that the CDS market may not be solely driven by default risks but also by other factors. Very recently, sovereign bond and CDS spreads have narrowed again to around 110 bp and 180 bp, respectively. With foreign bank lending of USD 278 bn or 65% of Austria’s GDP, Austrian banks are by far the biggest foreign players in the transition economies, both in absolute terms and relative to GDP, according to the Bank for International Settlements’ consolidated banking statistics. Emerging Europe has become the most important foreign region for the Austrian financial sector and Austria the most important financier for this region. Accounting for almost 50% of total Austrian foreign bank assets, Eastern Europe clearly stands out. Around 45% of Austria’s lending to Eastern Europe goes to economies such as Romania (USD 43.7 bn), Hungary (USD 36.9 bn), Russia (USD 22.4 bn), Ukraine (USD 14.3 bn) and Bulgaria (USD 5.5 bn). Since all these economies are currently facing severe economic slowdown or are suffering from painful economic adjustments of past exuberance in private sector credit, Austrian banks are exposed to rising household and business loan defaults. In light of already high household sector indebtedness and a heavy debt service burden (at 30% of disposable income in some economies), there is further pressure from the high prevalence of FX household loans, not least as a result of significant domestic currency depreciation over the past few months (see chart). Overall, as a result of the large banking sector exposure the government faces relatively high contingent liabilities. Recently, Standard & Poor’s estimated the banks’ gross problematic assets at around 12-24% of the domestic credit stock, which is equivalent to approximately 14-29% of GDP. Hence, the sovereign faces potential recapitalisation costs of 2% and 5.3% of GDP in S&P’s base and worst case scenario, respectively. DB Research Analyst Sebastian Becker concludes that Austria's debt ratios have only one way to go: up. As a result of the global financial and economic crisis the public debt ratio already rose to 62.6% of GDP in 2008 from 61.9% in 2007 (according to the OECD) and is expected to climb further to slightly below 70% of GDP by 2010. Austria’s fiscal deficit is forecast to soar to around 4-5% in 2009/10 from 1.2% of GDP in 2008 due to rising expenditures and falling tax revenues (similar to that of its neighbour Germany). Austria has outperformed Germany in the since 2002, experiencing swings in Germany with a 6 to 12-month delay. As Deutsche Bank has forecasted that Germany might contract by 5% this year, negative Austrian growth figures can be expected to rise further too. Recent media commentaries have billed trillions the new billions as expansive monetary policy has propelled money supply into hitherto unknown stratospheres and the US budget deficit has pierced the 13-digit mark. 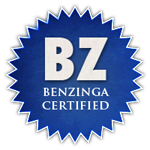 As a benefit to nature modern-day money creation works without paper and ink. Sand turned into microchips will awake the standing armies of digitally created fiat money at the disposal of central bankers who uniformly erred about the current crisis that may turn into a collapse later this year. One thing is for sure: There are enough FRNs around and if central bankers don't throttle money supply growth we may all end up as millionaires. That's a hundred for your burger please, madam/sir. Check out these very graphic computer drawings of 1 TRILLION Federal Reserve notes (in 100s) at pagetutor.com. 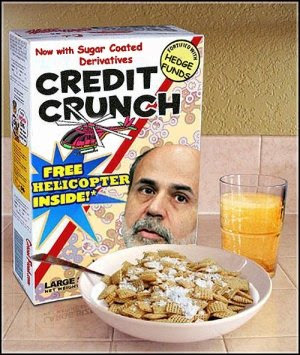 Word has it that Federal Reserve chairman Ben Bernanke breakfasts on a bespoke brand of cereal since August 2007. It has not yet been found out how many helicopters Bernanke commands in the ongoing turf war of fiat money. With its brevity, 140 characters per Twitt, it leaves room for condensed information only. As I read tons of websites every day I plan to post the best links in realtime when I come across that kind of anomalous news that shape my perception of markets and global policy. Go here to my Twitter Homepage to subscribe to my feed in order to read the most important topics ignored by MSM. To follow Twitter I use the TwitterBar for Firefox as a most convenient add-on.